In mammals, neurogenesis continues during adulthood in restricted places of the nervous system, namely the subventricular zone, the dentate gyms and the olfactory epithelium. A dual role of the second messenger nitric oxide has been reported in such places, either promoting or inhibiting proliferation of neuronal precursors depending on the cellular signal implicated. In this review the regulation of adult olfactory epithelium neurogenesis by nitric oxide is discussed. This review discusses recent cellular and molecular studies on the effects of the second messenger nitric oxide (NO) on neurogenesis in the adult olfactory epithelium, the tissue comprising the sensory cells of the sense of smell. In the olfactory epithelium, neurogenesis occurs throughout adult life, allowing the replacement of dying olfactory sensory neurons. Nitric oxide seems to act as a proliferative agent of neuronal precursors in the olfactory epithelium. The mechanism involved in this complex regulation is discussed. Neurogenesis is the process by which new neurons are generated from precursor cells. This process involves the proliferation, migration and differentiation of neuronal precursors from stem cells to mature neurons. It was believed for over 50 years that in mammals neurogenesis occurred exclusively within a limited time period during embryonic development. However, the generation of new neurons in a few areas of the adult nervous system has been recently demonstrated. Adult neurogenesis was described for the first time in rat hippocampus (Altman and Das, 1965) and, more recently, in the primate dentate gyrus (Gould et al., 1997; Eriksson et al., 1998). It has been proposed that adult neurogenesis is accompanied either by an increase in the neuronal number (Boss et al., 1985) or the replacement of dying neurons (Gould and Tanapat, 1999). The ability to generate new neurons in adulthood distinguishes the hippocampus, the olfactory bulb and the olfactory epithelium from the rest of the nervous system. The generation of new granular cells in the dentate gyrus has been reported, as well as the fact that new neurons are generated in the subventricular zone. These neurons migrate to the olfactory bulb, where they differentiate into mature interneurons and glomerular cells (Graziadei, 1973; Moulton, 1974; Graziadei and Monti Graziadei, 1980). As in other regenerating tissues, such as the skin, liver and hematopoietic cells, the presence of stem cells that give origin to the differentiated cells has been reported in the olfactory epithelium. 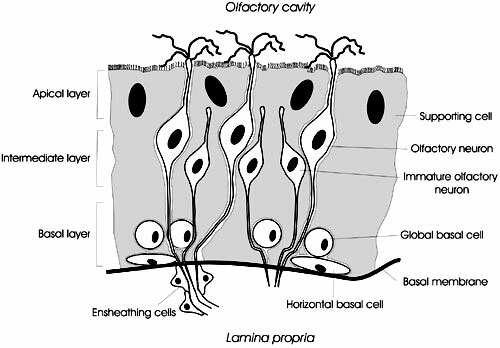 The olfactory epithelium contains three different cell types: supporting cells, sensory neurons and basal cells (Fig 1). The basal cells can be classified in horizontal cells, which express cytokeratin and exhibit a flat shape, and global cells, which have spherical shape and do not express cytokeratin. The olfactory epithelium is divided in three layers: basal, apical and intermediate. The apical layer contains the somata of the supporting cells (Hempstead and Morgan, 1983), the basal layer is adjacent to the basal membrane and contains the horizontal basal cells (Graziadei and Monti Graziadei, 1980; Calof and Chikaraishi, 1989) and in the intermediate layer are located the somata of the sensory neurons. These neurons display a bipolar shape, bearing a soma with an axon on one end and a single dendrite on the other. The dendrite terminates in the dendritic knob, the structure from where the chemosensory cilia project into the nasal cavity (Schild and Restrepo, 1998). Figure 1: Olfactory epithelium displaying its different cell types in their characteristic spatial distribution in the tissue. Olfactory transduction begins when the odorants bind to their receptors, located in the chemosensory cilia (Rhein and Cagan, 1980; Meneo et al., 1997). These receptors are proteins belonging to the G protein-coupled receptor family, with seven transmembrane domains (Buck and Axel, 1991). When the receptors are activated upon odorant binding, they stimulate type III adenylyl cyclase (ACIII) (Bakalyar and Reed, 1990) through a G-protein termed Golf (Jones and Reed, 1989). cAMP generated by this cyclase directly activates a non-specific cationic channel, known as cyclic nucleotide gated channel (CNGC) (Firestein et al., 1991; Scott et al., 1996). The opening of CNGC leads to an increase in free Ca2+ levels inside the cilia (Goulding et al., 1992), activating either a Cl- or a K+ channel, eliciting an excitatory or an inhibitory response, respectively (Morales et al., 1994; Morales and Bacigalupo, 1996; Morales et al., 1997). The term stem cells refers to immortal, multipotential cells with asymmetric division that can give origin to several cell types in a given tissue. Instead, precursor cells are those cells committed to a particular cellular fate (Cameron and McKay, 1998). Early radiographic studies suggested that the olfactory stem cells are part of the basal cells (Graziadei, 1973; Harding et al., 1977). Now it is generally accepted that new neurons and supporting cells arise from proliferation and differentiation of basal cells, although the cellular identity of the stem cells is still under debate, mostly because of the unavailability of specific markers for quiescent and undifferentiated cells such as the stem cells from adult tissues (Weiss and van der Kooy, 1998; Gage, 2000). There is evidence supporting both, horizontal and global basal cells as the olfactory epithelium stem cell. It has been proposed that the stem cells represent a subpopulation of the global basal cells, because they are mitogenic and multipotential (Caggiano et al., 1994; Feron et al., 1999a). Furthermore, at the peak of neurogenesis in the regenerating olfactory epithelium, most of the mitotic cells are global basal cells, rather than horizontal basal cells (Carter et al., 2004). The idea that horizontal basal cells are stem cells is based on the fact that they are a relatively quiescent cell population. As the stem cells of the hippocampus and subventricular zone, they respond in vitro and in situ to EGF and TGF-oc (Farbman and Buchholz, 1996; Getchell et al., 2002). Furthermore, horizontal basal cells are adjacent to the basal membrane and express the same cell adhesion molecules as the stem cells of other non-neuronal systems, such as the colon and the epidermis (Carter et al., 2004), and they give rise to all olfactory epithelium cell types (Leung and Reed, 2006). This evidence suggests that horizontal basal cells correspond to the stem cells, whereas global basal cells are the neuronal precursors. Basal cell mitosis occurs in two phases, slow and fast, in the same way as in the developing nervous system (Mackay-Sim and Kittel, 1991). During the slow phase, a stem cell divides every 50 days producing another stem cell, which stays close to the basal membrane, and a precursor cell which rapidly divides at least two to three times, generating many immature neurons. These immature neurons migrate away from the basal membrane as they differentiate (Mackay-Sim and Kittel, 1991). Normally, there is a permanent neuronal production in the olfactory epithelium, where a small fraction of the ORNs die and are replaced by new ones. In rodents, individual olfactory neurons can live for one year or further (Hinds et al., 1984). Neurons may die at anyone of several stages of their life cycle (Farbman, 1990; Carr and Farbman, 1992; Schwob et al., 1992; Mahalik, 1996), some of them as early as one day after mitosis (Carr and Farbman, 1992). Moreover, experimental damage destroying mature ORNs is followed by an almost complete regeneration and functional restoration of the tissue a few weeks after the lesion, depending on the magnitude of the damage (Schultz, 1960; Graziadei and Monti Graziadei, 1983; Astic and Saucier, 2001). When ORNs are damaged, the rate of basal cell mitosis increases dramatically (Cámara and Harding, 1984) and the progeny differentiates into fully mature neurons, expressing the olfactory marker protein (OMP) (Graziadei, 1973). Since neurogenesis occurs throughout the life span, it provides the adult olfactory epithelium with the capacity to replace the damaged olfactory sensory neurons, even after an extensive lesion such as that produced by axotomy (Smith, 1951; Schultz, 1960; Westerman and von Baumgarten, 1964; Graziadei and Monti Graziadei, 1979); or by exposure to xenobiotics such as zinc sulphate (Cancalon, 1982), methyl bromide (Hurtt et al., 1988; Schwob et al., 1995), Triton X-100 (Verhaagen et al., 1990), dichlobenil (Brandt et al., 1990; Delaleu and Sicard, 1995), copper (Saucier and Astic, 1995), iminodipropionitrile (Genter et al., 1994) or sulphur dioxide (Min et al., 1994). After axotomy, when the olfactory bulb (the synaptic target of ORN) is removed, the olfactory epithelium regenerates only partially, due to the lack of trophic factors (Schwartz Levey et al., 1991; Gordon et al., 1995). In the case of chemical damage (zinc sulphate or methyl bromide), however, the olfactory epithelium is fully restored (Cancalon, 1982; Schwob et al., 1995), allowing the experimental manipulation of the regeneration rate. Several primary culture procedures have been developed to obtain olfactory epithelial cells (Cunningham et al., 1999). There are cultures containing only ORNs, which keep their ability to respond to odorants (Barber et al., 2000) and cultures comprising only non-neuronal cells, such as supporting and basal cells (Newman et al., 2000). These cultures can be treated with growth factors that induce the proliferation or differentiation of neuronal precursors. Among the proliferation-promoting growth factors are FGF-2 (Newman et al., 2000), EGF (Mahanthappa and Schwarting, 1993), NGF (Plendl et al., 1999) and LIF (Bauer et al., 2003; Kim et al., 2005). The last one is released by dying ORNs and promotes proliferation of the basal cells (Nan et al., 2001; Getchell et al., 2002). On the other hand, BDNF (Buckland and Cunningham, 1998), NT-3 (Simpson et al., 2003), dopamine (Feron et al., 1999b), IGF-1 (Pixley et al., 1998) and TGF-(32 (Mahanthappa and Schwarting, 1993) promote differentiation of neuronal precursors. A key role on regulating neurogenesis during development of the central nervous system has been proposed for these factors. The expression of some growth factors and their receptors continues through the adulthood in the hippocampus, the subventricular zone and the olfactory epithelium (Holbrook et al., 1995; Seroogy et al., 1995; Okano et al., 1996). EGF stimulates proliferation of neuronal precursors in the hippocampus and in the SVZ of adult and new born rats (Tao et al., 1996; Kuhn et al., 1997). Furthermore, the expression of EGF and TGF-oc receptors in these three zones of active neurogenesis has been reported (Holbrook et al., 1995; Seroogy et al., 1995; Okano et al., 1996). The in vitro studies of the olfactory epithelium have allowed the identification several molecular markers, which are used to determine the neuronal differentiation stages. Stem cells express cytokeratin 14 (CK14), intercellular adhesion molecule-1 (ICAM-1) and Bl-integrin (Satoh and Yoshida, 2000; Carter et al., 2004), while immature neurons express nCAM, (Calof and Chikaraishi, 1989) and initially, specific neuronal tubulin (T(3III) and GAP43. When fully differentiated, GAP43 disappears and the expression the olfactory marker protein (OMP), gal-nCAM (Pays and Schwarting, 2000) and constituents of the odor transduction pathways, such as ACIII and odorant receptors, can be detected (Illing et al., 2002). Nitric oxide is a gaseous free radical produced by the enzyme nitric oxide synthase (NOS). It participates as a second messenger in intracellular signaling processes in the nervous system (Garthwaite, 1991; Snyder, 1992; Bredt and Snyder, 1994). So far, three NOS isoforms have been described: the inducible isoform (iNOS), whose activity is calcium-independent, the epithelial (eNOS) and the neuronal isoforms (nNOS), both of which depend on calcium. nNOS is expressed by approximately 1% of the neurons, but not by most adult sensory neurons, such as photoreceptors, olfactory neurons and dorsal root ganglia cells (Dawson et al., 1991; Verge et al., 1992; Schmachtenberg et al., 2001). NO can rapidly reach intra or extracellular targets by diffusion from its production site (Stamler et al., 1997a; Stamler et al., 1997b). The brief half-life and high reactivity of NO severely limit its action range (Garthwaite and Boulton, 1995). Several signaling systems are modulated by NO, whose effects in a given cell depend on the affected pathway. The most common target of NO is the soluble guanylyl cyclase (sGC) (Van Wagenen and Rehder, 2001). sGC generates the second messenger cyclic GMP (cGMP) upon NO activation. cGMP may gate ion channels and regulate protein kinases (Haynes et al., 1986; Bacigalupo et al., 1991; Pineda et al., 1996; Firestein and Bredt, 1998; Gudi et al., 1999). NO can also modify proteins directly by nitrosylation (Stamler, 1994). Protein nitrosilation seems to be involved in regulatory mechanisms of several cellular processes, including signal transduction, DNA repair, blood pressure regulation and neurotransmission (Stamler, 1994; Stamler etal.,1997a). Different functions have been established for NO in the nervous system of adult animals, such as its participation in the NMDA-induced neurotoxicity (Dawson et al., 1991; Dawson et al., 1993), neuroprotection and neurotoxicity after cerebral ischemia (Moro et al., 2004), GC regulation (Moneada et al., 1991; Nathan, 1992), synaptic plasticity modulation (Edelman and Gaily, 1992; Zorumski and Izumi, 1993), neurotrasmissor secretion (Dawson et al., 1994) and neuronal activity-dependent gene expression (Peunova and Enikolopov, 1993). Substantial experimental evidence supports the participation of NO in neurogenesis, but its specific role remains unclear. The first evidence was morphological, and demonstrated that NOS expression occurs "at the right place in the right moment" during embryonic and adult neurogenesis. It has been reported that NOS expression increases in several neuronal structures during embryonic development, and decreases in adulthood (Bredt and Snyder, 1994; Roskams et al., 1994; Keilhoff et al., 1996; Santacana et al., 1998; Schmachtenberg et al., 2001; Holmqvist et al., 2004). For instance, nNOS expression in the cortical neural plate of the mouse embryo during the period of maximal neurogenesis has been described (Bredt and Snyder, 1994). In the developing zebra fish embryo, the nNOS expression pattern correlates with the patterns of neuronal differentiation (Holmqvist et al., 2004). During neurogenesis of the adult olfactory system, the expression of nNOS has been reported in both the olfactory bulb and the olfactory epithelium (Roskams et al., 1994). This enzyme is also expressed in the adult mouse SVZ, where the neuronal precursors of the olfactory bulb are generated. Furthermore, after adult mice bulbectomy, NOS is quickly and transiently expressed in the regenerating olfactory neurons (Roskams et al., 1994). More recent functional studies report opposite effects of NO upon neurogenesis, promoting or inhibiting the proliferation of neuronal precursors (Peunova and Enikolopov, 1995; Kuzin et al., 1996; Obregon et al., 1997; Mize and Lo, 2000). Antiproliferative effects of NO during neurogenesis have been reported in Drosophila during neuronal development, where NO inhibits proliferation through the retinoblastoma (Rb) pathway (Kuzin et al., 1996; Kuzin et al., 2000), during brain development in Xenopus (Peunova et al., 2001) and, in mammals, during brain development (Chen et al., 2003) and in the adult dentate gyrus and SVZ (Packer et al., 2003; Matarredona et al., 2004; Moreno-Lopez et al., 2004). On the other hand, NO has been proposed as a paracrine or autocrine factor that promotes neuronal precursor mitosis during development of the olfactory system (Chen et al., 2004b). NOS expression has been reported in cultures of neuronal precursors obtained from mouse SVZ (Wang et al., 1999). NO promotes neurogenesis in the SVZ and the hippocampus of adult animals in response to ischemia (Zhang et al., 2001; Lu et al., 2003; Chen et al., 2004a; Keynes and Garthwaite, 2004). Furthermore, in ischemic dentate gyrus of adult mice, iNOS expression and activity are necessary for the stimulation of the proliferation of neuronal precursors (Zhu et al., 2003). In primary cultures of olfactory precursors, NO donors promote proliferation and iNOS inhibitors promote differentiation, inhibiting cell proliferation (Sulz, unpublished). It has been suggested that factors that regulate the sGS activity may have a role during neuronal development (Weller and Klein, 1992; Giuili et al., 1994), both in proliferation and survival of olfactory neurons (Chen et al., 2003), in axonic outgrowth and in synaptic plasticity in vitro (Hess et al., 1993). On the other hand, NO seems to stimulate proliferation of olfactory neuronal precursor cells in a cGMP-independent fashion (Sulz, unpublished). The experimental studies reviewed here indicate a dual role for NO in embryonic and adult neurogenesis (Fig 2), as NO synthesized by nNOS appears to reduce neurogenesis acting as an antiproliferative molecule (Bredt and Snyder, 1994 Roskams et al., 1994; Peunova et al., 2001 Packer et al., 2003; Holmqvist et al., 2004 Matarredona et al., 2004; Moreno-Lopez et al., 2004), whereas the production of NO by iNOS and eNOS seems to stimulate neurogenesis (Zhang et al., 2001; Lu et al., 2003; Zhu et al., 2003; Chen et al., 2004a; Keynes and Garthwaite, 2004; Reif et al., 2004). Figure 2: Neuronal precursors or stem cells respond in different forms to particular environmental signals. These cells express either nNOS in response to a normal neurogenic signal, inhibiting cell proliferation, or iNOS in response to an injury signal, stimulating cell proliferation. As in the GD and SVZ after focal ischemia, in the regenerating olfactory epithelium neuronal precursor proliferation is stimulated by NO likely produced by iNOS (Sulz, unpublished), suggesting that the NO proliferative effect observed in this tissue is functionally similar to those observed in other regenerating systems, where cell death is a signal that triggers iNOS expression in the damaged tissue. Accordingly, neuronal death in the olfactory epithelium would be followed by the generation of NO, which would stimulate proliferation of basal cells, the neuronal precursors. A plausible signal linking cell death and NO generation is the leukaemia inhibitory factor (LIF). When the olfactory neurons are damaged and die, they transiently generate LIF. At the same time, the LIF receptor (gp130/LIFR) is transiently expressed in basal cells, axons of apoptotic neurons and infiltrated macrophages (Satoh and Yoshida, 1997; Nan et al., 2001; Getchell et al., 2002; Bauer et al., 2003). Macrophage depletion at this time severely impairs proliferation of neuronal precursors (Borders et al., 2006). LIF induces basal cell proliferation in vitro (Satoh and Yoshida, 1997; Bauer et al., 2003; Kim et al., 2005), therefore it is a primary feedback signal that increases neuronal precursor proliferation in the event of sensory neuron death, acting via the JAK/STAT3 pathway (Moon et al., 2002). This action may involve NO, because in the immune system LIF induces iNOS expression through the JAK/STAT pathway (Kleinert et al., 2003). 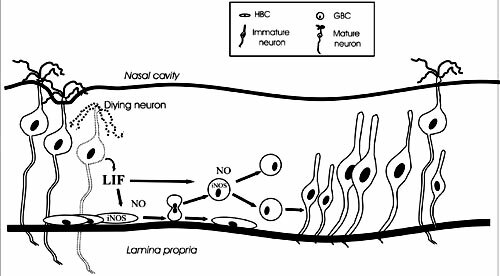 In this model, NO would act downstream of LIF promoting neuronal precursor proliferation after olfactory sensory neurons die (Fig 3). Figure 3: Model of proliferation induced by injury in the olfactory epithelium. A dying neuron produces LIF, which induces the expression of iNOS in horizontal basal cells (HBC) or global basal cells (GBC). 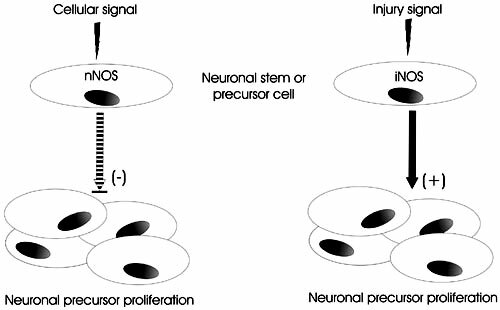 The NO generated by iNOS stimulates the proliferation of neuronal precursors. The evidence reviewed herein suggests a proliferative role for NO in olfactory epithelium regeneration. The mechanisms involved in the induction iNOS expression or of the NO proliferative effects are still unknown. Grants MIDEPLAN ICM P99-031-F, ICM P05-001-F and CONICYT Programa Bicentenario en Ciencia y Tecnología, ACT 45.